Fast, reliable Wi-Fi for the customers and guests that visit your business is essential for engineering a positive user experience. A key part of creating that experience is driving insight into your wireless network, both indoors and outdoors. 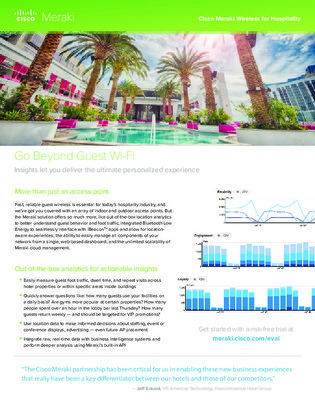 Learn about easy-to-deploy location analytics that help you understand guest behavior, dwell time, and foot traffic across your network.